Daytime temps will be above freezing, but not much… perhaps 4-5c and a significant windchill on occasions will make it feel distinctly colder than it has been. 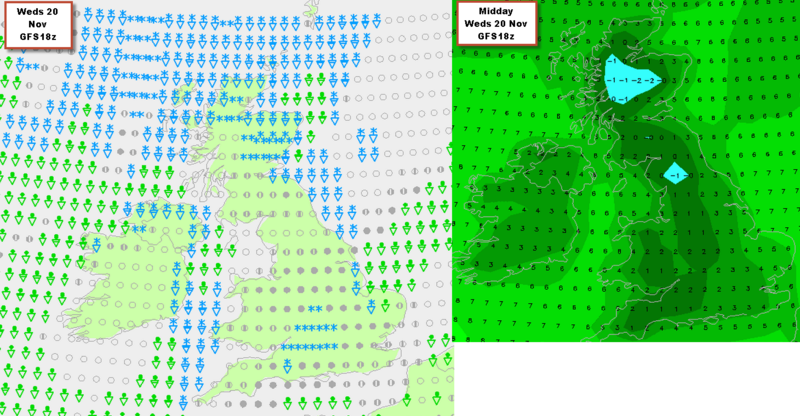 It will feel chilly at night, down to -2 or -3c. 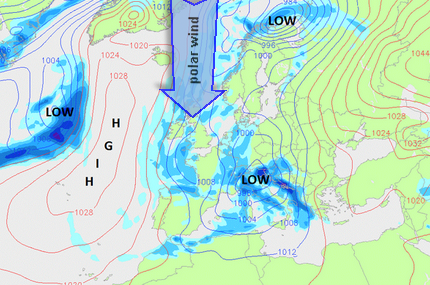 Any precipitation during this time will be wintry.. i.e. snow or sleet. Not much ppt is forecast for us in the SE during this time except possibly for places near the east coast but check back for updates on this. 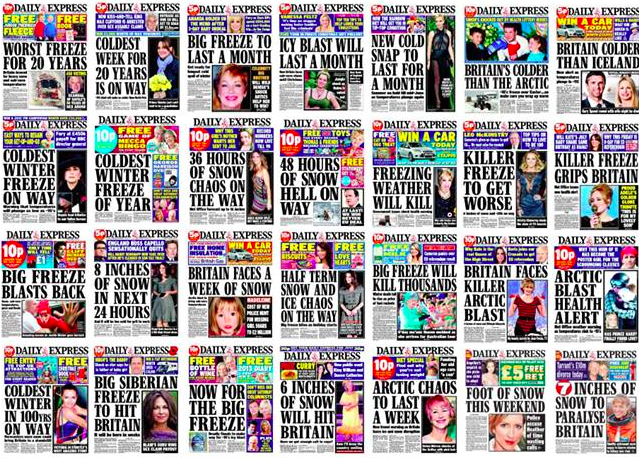 Meanwhile, it is usually safe to ignore alarmist headlines… check below and confirm that we are still here, despite the dire warnings from the past! The initial Arctic blast does not last that long: a toppling HIGH moves over from Iceland and across the N of Scotland later next week to effectively shut the door on the direct Polar air. 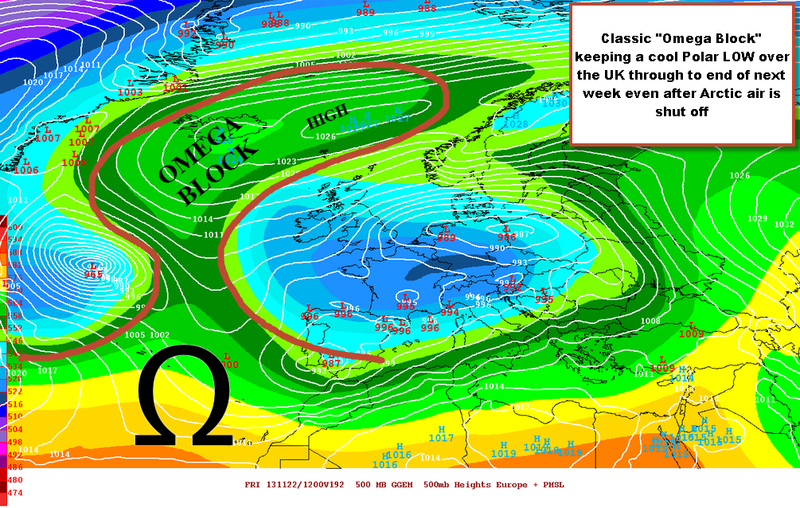 This pattern of weather can persist and is called an “OMEGA BLOCK” after the similarity in pressure pattern and upper wind flow to that of the Greek letter omega. Unfortunately, this pattern is likely to leave a large cut-off COOL POOL of frigid air over the UK and the near continent which can bring cool easterlies to the east coast which may penetrate inland across the SE giving Reigate continued cool weather through to next weekend 23-24 Nov . COOL POOLS usually warm up slowly but this can spark showers and later lead to slack gloomy conditions weather for the East coast. A very similar pressure pattern built this time last year Nov 2012: so this is not an unusual or especially extreme weather pattern. On the other hand, the chart below shows a really strongly negative Arctic Oscillation building up and this would usually mean a strong blocking pattern where Arctic air is allowed to leak periodically from the Poles because of a weaker pressure gradient in the Atlantic and a correspondingly weak jetstream. The jetstream acts like a belt holding cold air into the Polar regions, if it slackens off it can allow the cold air to escape more easily. 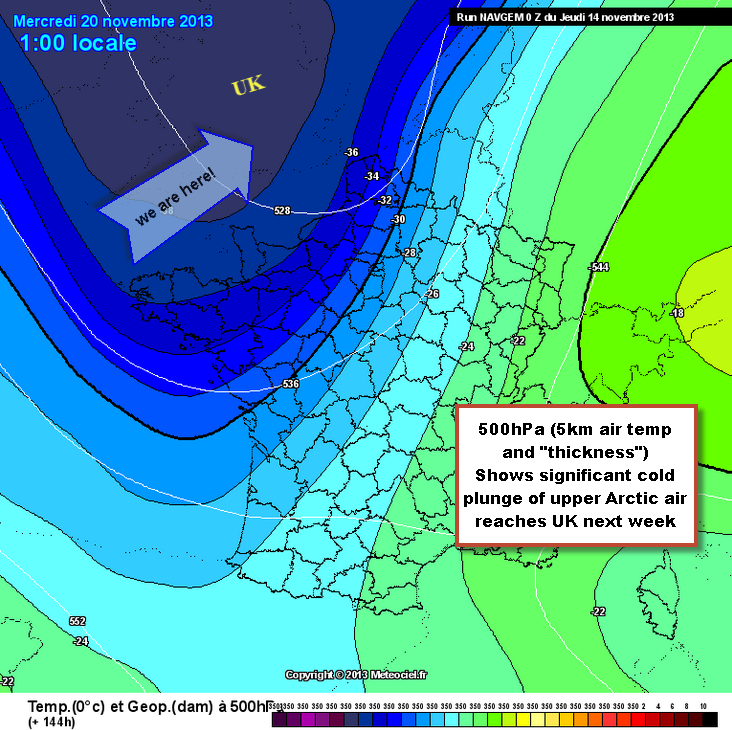 Cold end of November persisting is a possibility looking at the chart below.